It’s no secret that Set It Off like to toe the line of both pop music and the rock culture they’ve found themselves a part of. Over the years their sound has become more and more dominated by pop and R&B influences, and while their live performances are probably the main reason they’re still considered part of the rock culture, in a lot of people’s eyes they’re part of the 5 Seconds Of Summer-led crop that don’t belong there at all. With new album Upside Down, they only get further away from the rising pop-rock stars they once were. There isn’t a single rock song on Upside Down. Sure, guitars are somewhat present, but they’re drowned out by keyboards and synthetic beats. Even on one of the rare occasions they’re brought to the front of a track they’re feeble and seem more like an afterthought – strange considering there are two guitarists in their lineup. Of course, the fact that this album is pop music isn’t a criticism in itself – it’s just that it’s not good pop music. A common thread through Upside Down’s tracks is that hardly any of them feel fully fleshed out; instrumentally they focus on one single keyboard R&B motif (played by singer / keyboardist Cody Carson) and anything else just feels like accompaniment and nothing more. It might as well be a Cody Carson solo album. Speaking of Carson, he has plenty of irritating moments on this record. While he does have a great voice, he’s clearly decided he could be a serious contender for Justin Timberlake’s pop crown (fat chance), and the constant addressing-the-listener gimmick (being nagged to “sing it back!”, then “one more time!” gets old very quickly) is simply embarrassing. Life Afraid’s vomit-worthy “ladies! Fellas!” callout rings more than a few bells, too, and with closer Me W/O Us sounding like it was rejected from Justin Bieber’s new record, it doesn’t feel too much like a coincidence. Previous release Duality saw Set It Off showcase their ability to write great pop songs, so it’s really frustrating to witness them seemingly abandon that with any ties to the rock world. Picking apart Upside Down’s tracks individually is what really gets the blood pumping. Apart from the title track and Life Afraid (the obvious highlights / two of the poppiest inclusions), there’s next to nothing really memorable about any of it. There’s a feeling of a checklist being filled in as the record goes on. A couple of stompy, synth-led ballads (Want and Crutch), the hostile ‘rock’ song (Admit It), and a handful of never-done-before genre switch-ups – the totally refreshing, ’80s-tinged Diamond Girl and ballsy hip-hop jam (that isn’t really any of those things) Uncontainable. If only more bands did stuff like this! At the back end of the record – if you haven’t understandably given up yet – Hypnotized provides a glimmer of hope in its chorus’ funky vocal rhythm before it’s killed dead by Carson’s abysmal attempt at a rap. That’s another common theme here – any emergence of the old Set It Off getting buried under unnecessary experimentation. Life Afraid and Upside Down – the aforementioned album highlights – aren’t exempt from this, with the former featuring bongos, vocal samples and that cringeworthy middle eight. It’s nothing compared to the latter, though, which has some of the worst lyrics you’ve ever heard, but sung with a simpering naivety and practically audible deluded belief that people are actually relating – “hospital, got my third concussion / callin’ up my boss to explain, he says I’m losing my job / but at least I got more time to ride my bike” – really? There’s probably so much more to say about Upside Down, but it’s probably best not to. That way we can forget about this album more quickly and remember the days when Set It Off had nothing but potential that (thankfully) hadn’t been released on the world yet. With this album, rock fans definitely won’t want to be associated with them, and it’s doubtful that pop fans will either. But the main takeaway is that Set It Off have arrived, and if you have any sense, you’ll run in the opposite direction. 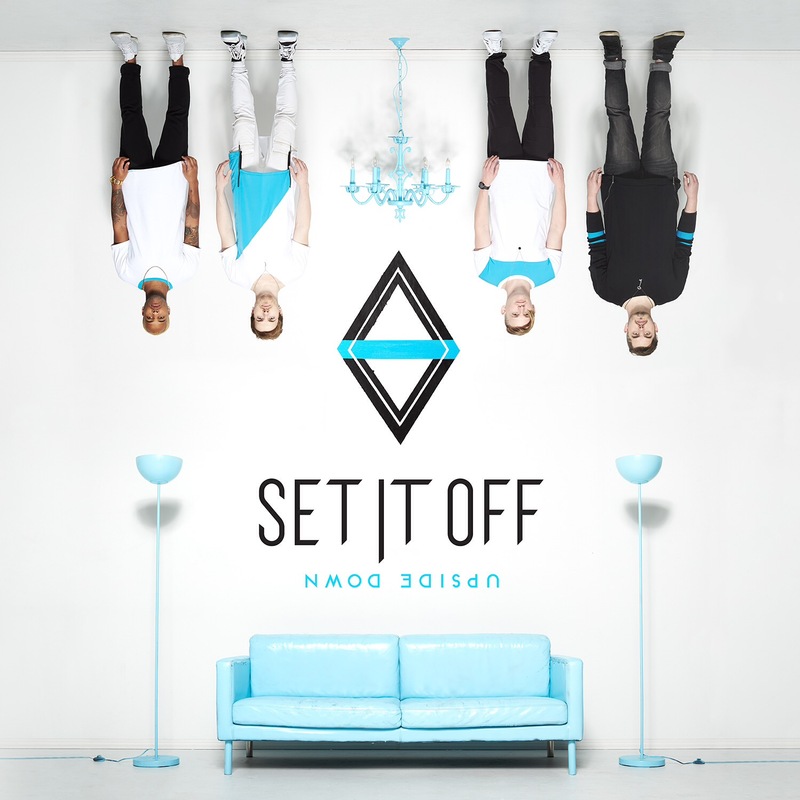 ‘Upside Down’ by Set It Off is out now on Rude Records.